I’ve been reading about the LightSquared debacle for months. My aviation-related sources have been covering the GPS industry’s objection to LightSquared and how it would be disastrous for the GPS receivers, essentially causing a loss of satellite lock or at minimum causing accuracy issues that could lead to disaster. The story received a boost in interest when it was found that there was some political chicanery associated with the White House administration pressuring a reversal in the testimony of an Air Force general. It’s hard to ferret out the underlying reason how this problem got this far, with so much money being invested in a technology that LightSquared should have known would hit a wall during its deployment, namely when it produced interference with a critical service like GPS that is adjacent to its bandwidth allocations. So I decided to do some research and summarize it here. The problem of radio interference isn’t new. The FCC and similar organizations in other countries were created primarily to help prevent interference problems by licensing radio spectrum and settling disputes among the radio spectrum’s users. All radio transmitters generate some amount of radio frequency (RF) energy on adjacent bands. All receivers are influenced by signals that are in adjacent bands because there is no such thing as a perfect filter to ignore nearby signals. So one must ask the question, is this an interference problem on the part of LightSquared, or a susceptibility problem for the GPS manufacturers? And since there is no such thing as a perfect filtering technique, how much can it help to apply filters to GPS receivers? Can the problem be solved with a 5-cent change to GPS receivers as suggested by LightSquared, a solution promptly dismissed as absurd by the GPS industry? I can tell you one thing that does not work, and that is to expect an industry to accept a problem introduced by some third party AFTER its products have already shipped and are in the hands of its customers. Sure, you can ask for a change to future products, assuming the change actually produces the desired result and isn’t too costly, but if an industry is entrenched, and I think that after 2 decades of shipping millions of products, GPS can be categorized as such, you can’t expect them to accept a problem that wasn’t a problem until your service came along. Nor can you expect all existing customers to ‘upgrade’ their equipment just to solve some newly introduced interference issue. Yet this is apparently what LightSquared was expecting. And I find that attitude arrogant and ridiculous. Anyone whose money is invested in a technology that expected such a system to work should expect to see his investment lost by those who dismissed or talked around these issues when they were first brought up. One might tend to lay the blame on LightSquared and its naivete, but I think the FCC is just as culpable. The FCC needed to realize that any service that occupied frequencies adjacent to GPS must necessarily be compatible with it. GPS satellites transmit signals from a distance of about 12,500 miles above the earth. Because of this vast distance, the signals are at a very low level once they arrive on earth, about -130 dBm (which is about 180 x 10^^-18 Watts). The land-based LightSquared 4G transmitters can use as much as 70 dBm (10,000 Watts). So you can see that there is a vast difference of roughly 2 x 10^^20 in signal strength between the two services. The low signal strength is one of the reasons why most Space-to-Earth signals require dishes or other types of high gain antennas pointed at the satellites to amplify only those signals and simultaneously ignore any signals originating from other directions. But GPS receivers cannot do that. First of all, the constellation of 24 satellites is in constant orbiting motion, and secondly, a GPS receiver needs an antenna that can receive from several satellites at once in order for it to do its job so it cannot use a directional antenna. A GPS receiver has none of the amplification and signal isolation benefits provided by a directional antenna. This means that the signals that a GPS receiver has to deal with are extremely weak, and are actually below the noise floor, and must be dug out of this noise floor using sophisticated signal processing techniques. 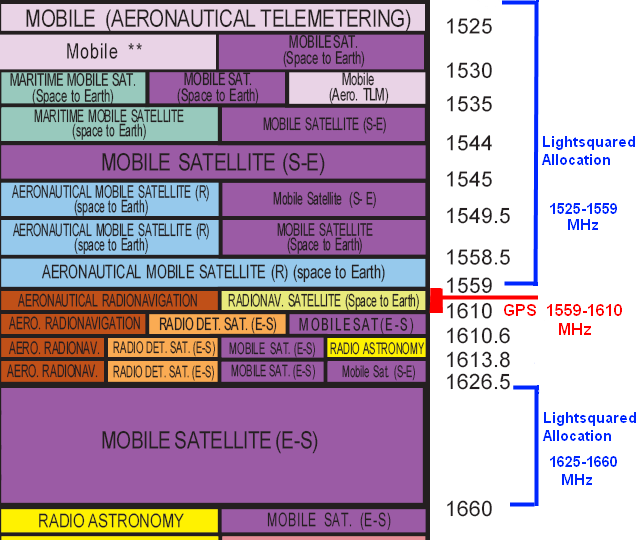 As shown in the graphic above, (source) the bands adjacent to the GPS spectrum were intended to be used for similar purposes, that is to send signals from space to earth or earth to space, and based on what I’ve been reading about LightSquared, this was how they intended to use the spectrum initially. But most broadband solutions that depend on satellites are not very compelling due to the 44,000 mile round trip the signals they need to make to the geosynchronous satellites. This trip adds about a half second delay which is too high a latency to provide a satisfactory experience compared with terrestrial broadband solutions, especially with modern Internet applications some of which cannot tolerate that kind of latency. People tend to use satellite broadband only when there are no terrestrial broadband offerings in their area. In 2004, presumably to make its service more financially attractive, LightSquared’s predecessor lobbied for and received authorization by the FCC to deploy thousands of land-based transmitters in the same frequency range as their satellite-to-earth band. I think that this authorization from the FCC is where things went awry. LightSquared, when it was a space-based wireless service that could hypothetically offer 100% coverage over the U.S. had a formidable calling card, namely that it could provide mobile wireless service to previously under-served rural areas. Telling a government bureaucrat that you’re going to provide ‘service to rural and the under-served’ is tantamount to telling them you’re going to cure world hunger or help the blind to see. Everyone knows there is little or no profit in serving the under-served, it just makes for a good story to soften up government bureaucrats so they’ll grant you favors. Indeed, earlier this year, the FCC allowed LightSquared to offer devices with just the terrestrial capability, making them nothing more than just another mobile wireless provider, which might be viewed as a clever bait-and-switch maneuver since those devices would no longer have the large size and expense of a hybrid phone. This would allow them to rake in some real profits by taking business away from the incumbents of lucrative mobile wireless services rather than being just some quirky satellite phone and data service. So more than any other factor, it was the decision to take its space-based frequency allocation and have the FCC re-authorize it for terrestrial transmitters that made it incompatible with GPS receivers. Even a very low-power transmitter that is in close proximity to a receiver will have signal strength that is many orders of magnitude stronger than one that is located 22,000 miles away. But if you can influence politicians by explaining away the problem, and hoping that the GPS industry looks upon it as an opportunity to force their customers to purchase new receivers that deal with the interference, then it would be a win-win for all parties, except those who have to buy new GPS receivers, namely consumers, who have no lobbyists to protect them. But it appears that all the hand waving about potential technical solutions may not make the GPS interference problem go away. There may be no filtering technique available at any cost that would fix it and still allow a GPS receiver to maintain the accuracy customers rely on. And so, in order for a company and its investors to enrich themselves, they appear to have no qualms about completely destroying another much larger industry that provides an invaluable service to many sectors of the economy. Some might think of this as free market capitalism. I think of it as sociopathic behavior so extreme that it makes me ashamed for the company and the politicians who did the company’s bidding. I have to wonder whether it’s even possible to provide an economical hybrid mobile wireless device that can be used with geosynchronous satellites and land-based cells. Iridium provides mobile phone service based on satellites, although that service nearly went broke and was only revived when its multi-billion dollar investment in satellites was picked up for pennies on the dollar. But Iridium is a completely different technology since its satellites are in low earth orbit, just 485 miles above the earth, and so the distance is about 2% as far from the earth as a geosynchronous satellite thereby requiring much less power from the mobile device to establish a connection. But these phones and service are very expensive compared with standard mobile phones. The phones tend to be large and bulky and cost upward of $1200. The service is metered at $1.30/min or more in addition to a $50 monthly fee. Compared with standard mobile phones this would not be a competitive offering, so getting the go-ahead from the FCC to have terrestrial transmitters was a key win for LightSquared because a phone that communicated with geostationary satellites would be very large, power hungry, and costly. The amount of power and antenna you’d need to communicate with a geosynchronous satellite would be difficult to implement in a handheld device that fits in one’s pocket, if it could be done at all, unless they intended for it to go through some form of a roof-mounted gateway. But then it wouldn’t really a true hybrid mobile device as this service had been promoted. And you couldn’t use a satellite handset from inside a car or house without a roof-mounted antenna and transceiver due to blockage of the satellite signals, making the service appear like something that may feel like a throwback to 1980’s technology. Hughes has offered a satellite/terrestrial mobile phone solution called GMR1-3G for some time. The hardware looks like something you’d need if you were deployed to some remote corner of the earth. In fact, LightSquared initially had planned to use that service before switching to something called EGAL which stands for Earth Geostationary Air Link from Qualcomm. EGAL appears to be some new hypothetical hardware/service that has yet to be deployed. Interestingly, Qualcomm is the company that came up with the estimate of 5 cents for the filter that would fix the GPS issue. It is usually not a good sign when a company gathering large sums from investors is basing its future success on a yet-to-be proven technology while simultaneously ramrodding its agenda by forcing a government agency to grant approval and thumbing its nose at its spectrum neighbors. These folks need a wake-up call. Maybe the sound of a few billion dollars of their investment swirling around a drain will provide that wake up call for Lightsquared and its investors and anyone foolish enough to embark on a similar venture in the future. UPDATE (2011-11-11) If you would like to know more about the testing that was done that showed the significant interference on GPS receivers, the Coalition to Save our GPS has a complete list of test reports on their website. The summary is that during these tests, nearly all GPS devices tested couldn’t receive a signal when they were within a few miles from the tower, even though the LightSquared transmitter was operating at 10% of the power they would be permitted to use. In addition, LightSquared claimed that if they simply moved their signals to the first 10Mhz of their allocated bandwidth, then 99% of the GPS receivers would not have been affected, even though there is not a single shred of evidence from this test that would support that claim. This entry was posted in aviation, business, technology by Lee Devlin. Bookmark the permalink. Your carcinogen analogy is priceless. It is a typcial fear mongering argument spread by GPS trolls. LightSquared will not kill anyone. Why go there? You have a fundamental misconception of the issue. The MSS spectrum licensed to LightSquared is adjacent to GPS. LightSquared worked with the GPS industry in eary 2000 to design a cooperative deployment agreement. And yes, GPS industry not only approved but supported the deployment. The LightSquared signal does not leak into the GPS band whatsoever. In fact the filter is designed for a sharp fall off and a 4MHz guardband was put in place for additional protection. The bottom line is that GPS receivers use the lightsquared spectrum without permission. GPS receivers should have been built to access the GPS section of the spectrum. Instead, they decided to consume additional bandwidth they did not own in order to keep cost down and improve accuracy to prop up corporate margins. Now the GPS undustry uses the argument that since the MSS band was low power in the past that they had a right to use the bandwidth? How screwy is that? Just because your neighbor has vacant land, it does not give you the right to build a garage on it. The issue is so clear, yet misguided GPS sympathizers claim a right to use spectrum they do not own and have no right to use.